of instant historical record of the pace, progress, problems, and the hopes of society. On the other hand--and here's the puzzle -- the news provides, at best, a superficial and distorted image of society. . . . The puzzle, simply put, is this: How can anything so superficial be so central to our lives?" May 1, 2006 | SMITHFIELD -- The lives of long-time residents and potential residents will be affected by the outcome of litigation against the city, concerning potential procedural problems arising during a rezone of agricultural land into a 90-plot subdivision. Smithfield resident Jeff Gittins has filed lawsuits with the Smithfield Appeals Authority and the 1st District Court, claiming the City Council followed improper procedure when they rezoned land at approximately 200 North 600 West from agricultural to residential on Jan. 25, and that the problem was exacerbated by confusion that followed the rezone at the council meeting Feb. 8. In his arguments to the Board of Adjustments on Thursday, Gittins said, "After the meeting in January, the outcome was not what I wanted but I respected the decision of the City Council. Then the decision was changed by the council. If the city expects the public to adhere to their laws, then they must adhere to their own laws." A Smithfield map shows the rezoned area; agriculture is in green. Gittins said there were three mistakes the city made. First, the paperwork for the ordinance was not ready to sign on the night of January 25; second, on January 26 when there was confusion among council members about where exactly the boundary was, the city did not turn it over to the Board of Adjustments to determine; and third, at the Feb. 8 meeting, the council created a new rezone without holding a public hearing or providing sufficient notification about the meeting. The rezone has been a controversial issue for several months because of the potential effects of the outcome. Neighborhood Nonprofit Housing Corporation would like to have half of the plots on the land to create low-income housing for new residents, but many people believe that complaints from the new residents will drive nearby farmers who have lived in Smithfield for many years off their land. Lamont Poulsen, resident of 30 years, has property bordering the new subdivision, and said that even though NNHC says the people moving in will be aware that they will be living near cattle, a dairy and other agricultural land and will sign a non-complaint agreement, "history shows that eventually the farmer will be driven out. "My great-granddad owned this property. The city says the want to preserve the agricultural feel of the area, but this is the only agricultural land left, and once they start making it residential, they won't stop," Poulsen said. "It'll take a while, but cattle and people don't mix, and the complaints will drive us off our land." 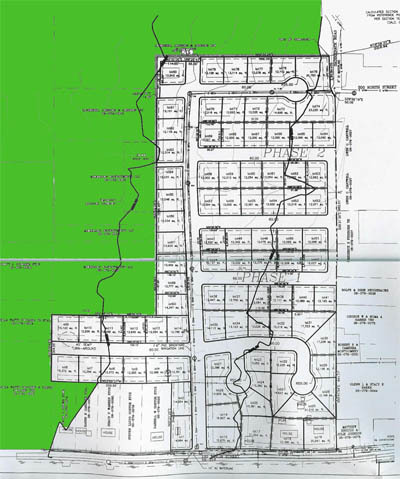 Poulsen and Gittins own much of the land surrounding the new subdivision and Poulsen said he feels like the city council is not protecting the rights of residents but catering to people that don't yet live in Smithfield. "Why do we have a city council if they don't listen to the people that elected them?" Poulsen asked. Councilwoman Kris Monson, who voted to oppose the rezone, said she thinks Smithfield residents are not being listened to. She said the Planning and Zoning Board recommended not passing the rezone and that she agrees with them. The Board of Adjustments tabled the hearing on Gittins's lawsuit until the 1st District Court makes a ruling. Gittin's lawyer, Chris Daines, said the case will probably be heard within the next two months. Even when resolution to the rezone occurs, the plans of the NNHC, the future of bordering farmers and the ultimate effect on Smithfield will not be easy answers to find.